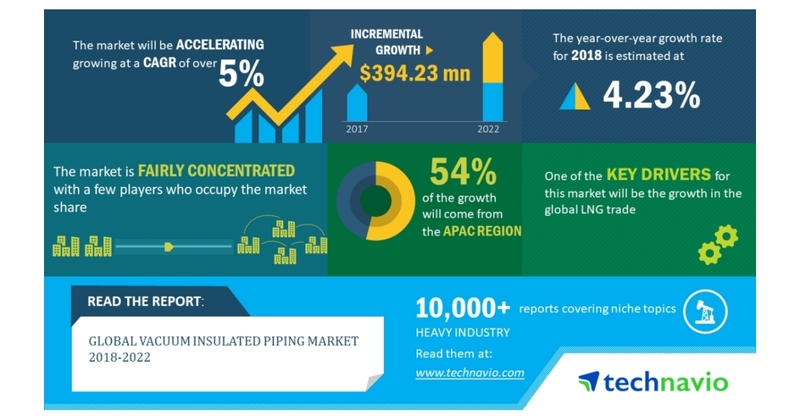 LONDON–(BUSINESS WIRE)–According to the latest market research report released by Technavio, the global vacuum insulated piping market is expected to accelerate at a CAGR of over 5% during the forecast period. Development in the global LNG trade is one of the key factors triggering the growth of the market. This research report titled ‘Global Vacuum Insulated Piping Market 2018-2022’ provides an in-depth analysis of the market in terms of revenue and emerging market trends. It also includes an up-to-date analysis and forecasts for various market segments and all geographical regions. In 2017, the APAC region accounted for 45% of the global market and is projected to reach 47% by 2022, exhibiting almost 2% increase in market share. The development of the rapid surface chilling process for poultry industry is a key trend in the global vacuum insulated piping market. Food poisoning issues are a rising concern in the food industry because of the lack of proper food processing. This is mainly because of the various bacteria present in the food items. For instance, the Campylobacter bacterium is a major cause of food poisoning in the UK.